Happy 2018! Here at SAY San Diego, not only does the important work of 2017 continue into 2018 – our 47th year – we also think about new possibilities and opportunities! As an organization, we pride ourselves on going above and beyond where we have resources and competencies to bring and to share. Therefore, coming into 2018, we are investing in innovation to solve some of our region’s pressing problems. One such pressing problem is the high need for affordable, top quality early learning, child care and preschool. Beyond limited publicly-subsidized preschools, few preschool options exist for low and low-to-moderate income parents in San Diego. The typical monthly cost of quality child care and preschool is more than monthly tuition at San Diego State, upwards of $800-$1200 each month, per child. Understandably, for working families of any income level the pressures of affordability are greater here than many other areas, since San Diego is among the nation’s most expensive locations to raise a family, and the local self-sufficiency wage is well above the federal poverty level. Among SAY San Diego’s clients are parents with young children across a wide socio-economic spectrum, continuously searching for, but not finding, child care and preschool options they can afford. Our experience is reinforced by research citing that nearly 70% of all local families with young children cannot find affordable, high quality preschool. SAY San Diego has undertaken a major planning initiative, which will come to fruition in 2018, to expand affordable, high quality preschool. 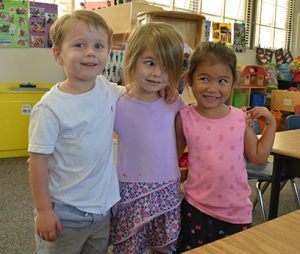 There’s no question that high-quality preschool is related to higher levels of behavioral/emotional functioning, school readiness, academic achievement, educational attainment, and eventual income. It also enables many parents to work and grow in their jobs. The early years of a child’s life are so fleeting and precious. We are excited to tackle this local challenge. For more information contact me at any time: gro.o1556128149geidn1556128149asyas1556128149@ycna1556128149n1556128149. In addition, perhaps you will consider helping with resources for our preschool expansion? Please see: Pass the Hat for Preschool – our campaign which receives additional bonus funds now through January 28. Many thanks for your ongoing partnership and support! 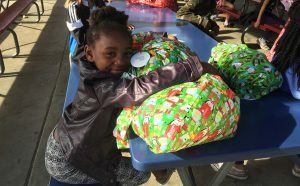 THANK YOU to all who donated to SAY San Diego’s 2017 Holiday Hopes Campaign! We brightened the holidays for a record number of families this year thanks to your generous support. Whether it was a toy for a child or food for a family, the many gifts from SAY supporters this holiday season were a kind reminder to others that they are not alone. If you are considering an end-of-year gift to to help children and family year round, please donate to SAY through the Champions for Youth campaign. Every gift qualifies SAY San Diego for bonus funds from the Century Club of San Diego. 100% of your donation goes to SAY, and there are no fees for online giving by credit card. It’s the best way to give to SAY San Diego during the holidays and beyond. Champions for Youth runs through January 28, 2018. Thank you again for making a difference this holiday season. May all the joy you brought to others also come your way! This month, SAY San Diego brings awareness to two very important issues – mental health screening and domestic violence prevention. October 5, 2017 marks National Depression Screening Day, when we encourage all San Diegans to check in with their emotional well-being. Mental and emotional health are just as important as physical health, but can be harder to address. The countywide It’s Up 2 Us Campaign, reports that one in five adult San Diegans suffer from a diagnosable mental health challenge and nearly one out of every five children experience some degree of an emotional or behavioral difficulty. Too often, people do not seek professional care and support, or give support, because of the stigma that is associated with having a mental illness. With this post and by participating, we encourage everyone to pay attention to signs of depression in loved ones and in ourselves. In October, SAY San Diego draws attention to Domestic Violence Awareness, a focus that we have all year long. Domestic and family violence sadly affect tens of thousands of San Diegans every year, and are root causes identified in one of every five homicide cases in our County. In recent years, SAY San Diego has increased its focus on preventing, identifying and building up a comprehensive network of intervention resources in the area of domestic violence prevention, to assist our clients. We hope that you will join the conversation about prevention and crisis intervention by joining SAY staff in wearing purple on October 19, to show support for victims and survivors of domestic violence. At SAY San Diego, our vision is opportunity, equity and well-being for all San Diegans. Our dedicated staff provide critical support in areas such as substance abuse prevention, mental health counseling, child abuse prevention, juvenile delinquency prevention, and youth development. We are proud to offer services and resources that prevent mental health and domestic violence crises, and enable residents of our community to overcome some of life’s biggest challenges. For Iris, these words of wisdom guide her life and help her to keep her two sons on the right path. Behind the words lies an unyielding optimism and desire to succeed which she learned from her grandfather, a self-made man who was locally famous for his successful market and butcher shop in Mexicali. These traits helped Iris through significant challenges when she became a struggling single parent who sometimes failed to make ends meet. 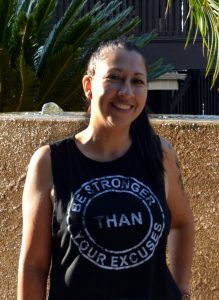 Iris connected with SAY San Diego’s Family Self Sufficiency (FSS) program as part of her plan to move beyond part-time work and find stable housing. The FSS program pairs case workers with unemployed or under-employed San Diegans who are looking to explore new personal and professional opportunities. FSS provides emergency assistance, job leads and referrals, free tax preparation, education and career guidance. For Iris, the individualized support she received from her FSS case manager was key. She received assistance with job leads, resume writing, emergency food, transportation (gas cards), and school supplies for her sons. While Iris loves her new job, she believes education is king. “I’m going to get my bachelor’s. It might take me a long time, but I’m going to get it.” Her advice to her sons and other young people, including single moms like her, relates to education, which she believes gives you more choices and chances. Iris is one of nearly 500 people who are helped by SAY San Diego’s FSS program annually. 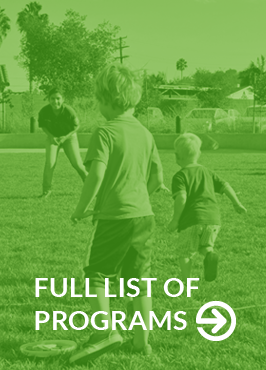 SAY offers more than 30 programs that invest in the success of youth, families, and communities every day. For more information about the Family Self-Sufficiency program, contact Melanie von Schroter, 858-565-4148 x281. Do you know about Advocates for Change Today (ACT)? ACT is a youth-led effort, staffed and convened by SAY San Diego, and devoted to improving community health and safety, especially in the area of drug and alcohol abuse prevention. ACT operates year-round and involves youth leaders, ages 12-16, as part of SAY’s larger Alcohol, Tobacco and Other Drug prevention programs in the Central Region. In June 2017, ACT said a fond farewell to their graduating seniors, but with the addition of 10 new high school youth members and two new middle schoolers, the program is busier than ever! They focus on prevention by acting to improve the community environment in City Heights. In addition to leading peer workshops on topics such as the dangers of impaired driving and drug- and violence-free prom and graduation, ACT youth leaders also engage the larger community. To raise awareness and active concern among community and business partners, ACT members designed hanger tags and colorful posters as platforms for their advocacy and made connections at frequently-visited community spaces – including Hoover High, City Heights Library, Fair@44 and the YMCA, as well as businesses including Tasty Pizza, Yum Yum Yo Boba Shop, Starbucks, Denny’s, El Super, Jamba Juice and CVS – asking management to display them in high-visibility areas where teens tend to congregate. We are especially proud that ACT youth recently had the opportunity to present their achievements at the county-wide Youth Leadership Partnership Meeting, and to attend La Colonia Eden Gardens Leadership Camp in Julian. Future ACT youth-led projects include conducting store assessments of all liquor stores and markets on El Cajon Blvd. to support the Live Well San Diego Community Market Program, and promoting Prescription Drug Take Back Day (October 28, 2017) as part of Binational Health Week. The Grand STEM Challenge Camp was a huge success! By SAY San Diego Board Member, LaDreda Lewis. SAY San Diego was thrilled to receive a grant from Northrop Grumman to host the second annual Grand STEM Challenge Camp, in partnership with Sylvan Learning of La Mesa. The STEM Camp – focused on Science, Technology, Engineering and Math — was held at the Jacobs Center for Neighborhood Innovation for two weeks, July 10-14 and July 17-21. The focus of this year’s STEM Camp was to engage groups that are underrepresented in STEM education and careers throughout every aspect of the program. 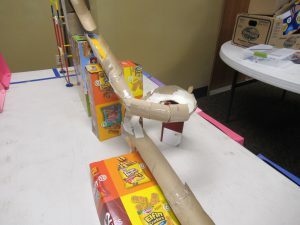 The Grand STEM Challenge Camp uses a project-based learning approach in which students are taught engineering skills through examining a problem which needs to be solved. The week-long camp was set up so that on days 1-2, students were taught the engineering process through “mini-design challenges.” On day 3, a main challenge was introduced: “Build a machine out of K’NEX and other materials that can move a ping pong ball from a six-inch space at one end of a table to a six-inch space at the other end of the table. The ball cannot be touched, must be started with an outside force and cannot fall off the table or bounce back.” Students spent days 3-4 designing, testing and redesigning their machines. Day 5 was the final build and competition day. Participants included 60 students entering grades 3-8. Week one included a group of African American youth from The Links to STEM program and an all girls’ group formed with the support of BeWise (Better Education for Women in Science and Engineering). Week two included 7th and 8th graders from O’Farrell Charter Middle School linked to SAY San Diego’s program there, as well as participants were selected by Sylvan from students whose families previously worked with Sylvan through the San Diego Unified School District’s Supplemental Education Services (SES) and students from the Jacobs Center’s programs. As Independence Day approaches, we think about the iconic saying, “Freedom Isn’t Free.” As we commemorate the holiday, let’s think about the brave men and women who are currently serving and those who have served our nation around the world to protect the American way of life. They are often away from their families for long periods of time while deployed to distant lands, which creates immense hardships for service members and their families. Many service members in combat zones are at incredible risk and often come back from service with both physical and psychological wounds that may impact them for the rest of their lives. Yet, others pay the ultimate sacrifice and never came home. These sacrifices are what is meant by the saying, “Freedom Isn’t Free.” Each of them “at one point in their life wrote a blank check made payable to ‘The United States of America’ for an amount up to and including their life.” But, when asked, these American heroes will say they are proud to have served and that they would gladly do it again. We owe these service members, veterans and their families a priceless debt – our very way of life, our freedom, and we should never take for granted the sacrifices they’ve made for every American. 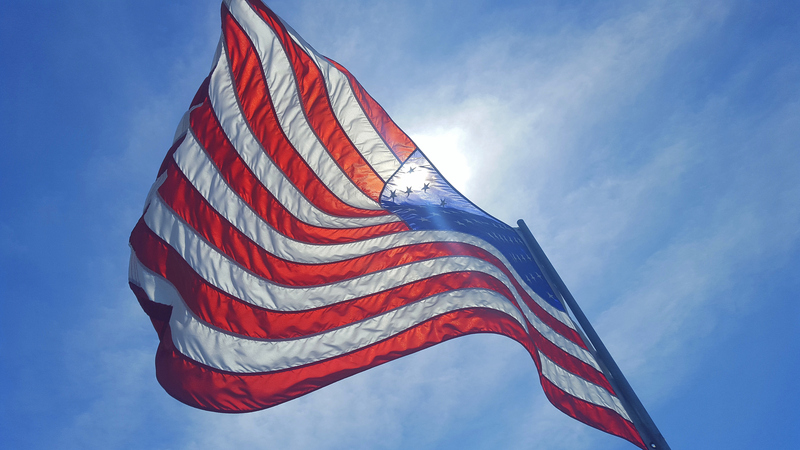 This Fourth of July, take a moment to honor all service members and veterans for their contributions to our freedom and American way of life. They paid the price for our freedom. As we close the books on the fiscal year ending June 30, 2017, and enter our 47th year of operations, all of us at SAY San Diego – including our Board of Directors, 480+ staff members and 700+ volunteers and interns – join me to express our deep gratitude for your phenomenal support that truly fuels our work. Especially during these uncertain times for nonprofit funding, our many program participants, community partners, and key investors across all sectors of human services help us to ensure that we continue to have life-changing impacts. This is indeed a cause for celebration! For thousands of youth and families each year, SAY San Diego’s extensive case management services create new pathways to independence, and to freedom from stress and fear. We recognize that no one wants their situation to be known as a “case” – yet, excellence in case management is core to our approach and our mission to partner with youth, adults, and families and enable them to reach their full potential. It is a collaborative process of assessing, planning, facilitating, coordinating and advocating for options and services, in and outside of SAY San Diego, which meets an individual’s and family’s comprehensive needs and enables them to achieve sustainable opportunity, equity, and well-being. Father’s Day dates back to the middle ages when on March 19 it was celebrated as the feast day of Saint Joseph. It is celebrated worldwide on various dates but in Latin America was adopted from the March date celebrated by the founding Spanish and Portuguese explorers. However, it was not celebrated in the United States until the 20th Century. In the US, Father’s Day, which we will be celebrating this Sunday, originally evolved as a memorial. Back in 1907, Grace Clayton proposed a day in remembrance of 360 men lost in a mine explosion in Fairmont, West Virginia, which left many children fatherless. In 1909, a year after Mother’s Day became officially accepted, Sonora Smart Dodd of Spokane, Washington, was listening to a Mother’s Day sermon at her church. She admired her father for raising his six children alone so she decided she wanted to honor her father and all others in a similar way. She promoted her idea to local clergymen who agreed that a day would be chosen to honor all fathers and on June 19, 1910, sermons honoring fathers were presented throughout the city. Although the event lost momentum for a decade, in the 1930s, Dodd re-promoted the celebration, with other cities across the country copying this event. Merchants encouraged the commercial aspect of the holiday, introducing a bill in Congress in 1913 to recognize Father’s Day. However, Congress resisted due to a concern for the risk of excessive commercialism. 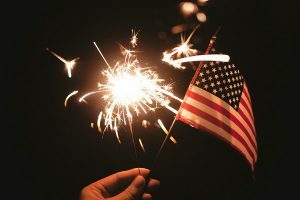 In 1924, President Coolidge recommended that the day be observed throughout the entire nation but Congress defeated several attempts to formally recognize the holiday. In 1966, President Johnson issued the first presidential proclamation honoring fathers and designated the third Sunday in June as Father’s Day. 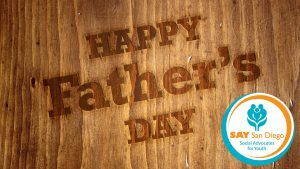 The day became a permanent national holiday when it was signed into law by President Nixon in 1972, formally recognizing the role that fathers have played in our lives. May brings Mother’s Day. June brings Father’s Day. Both months are filled with abundant family activities – weddings, graduations, the end of the school year, the beginning of summer. Among national recognitions at this time of year is National Foster Care Month in May. 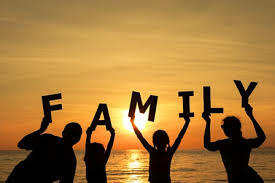 Here at SAY San Diego, we celebrate the essential value and importance of family every day, and affirm family as self-defined, composed of members who are significant to one another whether related by blood, legal bonds, or bonds of caring. It is, therefore joyful for us to step back at this time to celebrate the season of the family. In our everyday work, family resilience, family well-being, and supporting families in the many complicated tasks of raising the next generation are a central focus. Several SAY San Diego programs are premised on the evidence and science of family strengthening, including Community Services for Families, Family Self Sufficiency, First 5 First Steps, Project KEEP, and multi-solution/multi-agency work conducted by SAY San Diego’s Crawford Community Connection, Military Family Resource Center, O’Farrell Family Support Services, and Serra Real Connections. All of these programs take into account that children do well when families do well, and families do well when they are connected to supportive communities and systems. Why conduct family strengthening interventions? Recently someone asked me, “How can you teach parenting? Why would families listen? Do parents really change their approach…after all don’t we all just do what our parents did?” There’s a saying, often credited to an anonymous source, which fits here: “the problem with being a parent is that by the time you are experienced, you are usually unemployed!” Until the art of parenting comes with a full-proof operating manual that forecasts everything, family strengthening work helps to take the place of that operating manual. The practice honors the family, however defined, in the herculean mission of raising children – providing coaching, educational resources, counseling, services, connections and networks to enable each and every parent to be the best they can be.